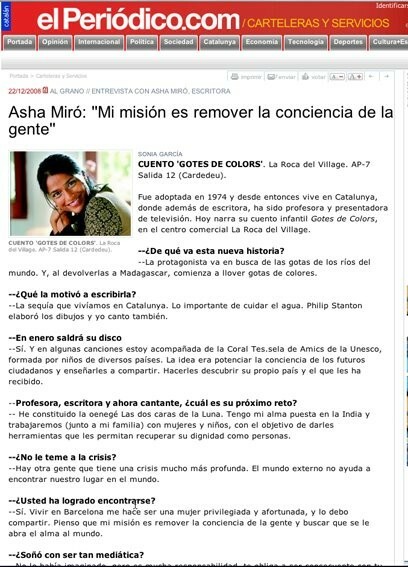 Gotas de colores” es una aventura musical alrededor del mundo. Un libro escrito por Asha Miró con ilustraciones de Philip Stanton y la colaboración de Nacho Lesko. 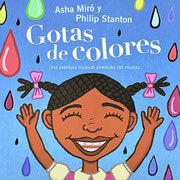 Asha Miró presenta su nuevo libro infantil “Gotas de colores”, una aventura musical e ilustrada por Philip Stanton que cuenta la historia de una niña africana, Nirina, que viaja por todo el mundo en busca de ríos donde recoger gotas de colores mágicas y poder regar, así, su seco poblado. Acompañada de Divi, una garza real que conoce muchos lugares en el mundo, Nirina emprenderá un viaje en busca de gotas de colores donde descubrirá las costumbres y culturas de cada país y aprenderá las canciones que cantan los niños en sus diferentes idiomas. "Mi fascinante viaje a través de las canciones, para descubrir nuevos lugares, llenos de magia y color"
Thank you for any other informative website. Where else may I am getting that kind of info written in such a perfect manner? I have a venture that I am simply now operating on, and I have been at the glance out for such information. If some one wishes to be updated with newest technologies after that he must be go to see this site and be up to date every day. Fantastic website you have here but I was wanting to know if you knew of any community forums that cover the same topics discussed in this article? I'd really like to be a part of community where I can get feedback from other experienced individuals that share the same interest. If you have any suggestions, please let me know. Cheers! Having read this I thought it was very enlightening. I appreciate you taking the time and effort to put this information together. I once again find myself personally spending a lot of time both reading and commenting. But so what, it was still worthwhile! I got this website from my pal who shared with me on the topic of this web site and now this time I am visiting this site and reading very informative articles here. I blog quite often and I really appreciate your information. The article has truly peaked my interest. I am going to bookmark your website and keep checking for new information about once a week. I subscribed to your RSS feed too.